We would like to introduce our newest member of the Dengie Sales Team, Kate Deegan who joins us as the Area Sales Manager for Ireland. 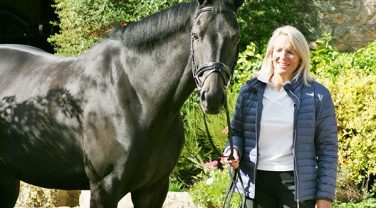 Kate moved to Ireland in 2006 with her husband Paul Deegan where they ran a successful racehorse training business together for 12 years, but now Kate is looking for a new challenge. “I’m really excited to join the team. Dengie has a wide range of products that are suitable for not just leisure horses, but also the racing market too. I’m looking forward to combining my passions and developing the Irish market for Dengie.” says Kate. Coming from a farming background and regularly competing at Pony Club, Kate studied at Cirencester gaining a BSC honours in International Agriculture and Equine Business Management. Utilising her degree Kate spent time in New Zealand working on stud farms before returning to the UK to work as a pupil assistant to jump trainers in Lambourn and then as an assistant trainer in Newmarket. In her spare time, Kate now competes in show jumping and partakes in Riding Club activities. “Dengie are thrilled to have Kate on board. She brings a wealth of knowledge and expertise from her previous positions and will be a great asset to our team.” says Laura Dolphin, National Sales Manager.